我爱北京天安门。("I love Tiananmen in Beijing."). To this day, I can still feel my excitement at that moment. I stared at those characters, shouting in my heart "I can write! I can write now!" I had no idea what Tiananmen was or even what Beijing was. But that was the beginning of my journey in Chinese literacy. By the end of my elementary school years, I had learned multiple levels of textbooks, read short stories and longer fictions. The most frequently encountered positive characters were: 红小兵 (hong xiao bing—Little Red Scarves), 工人 (gong ren—workers), 农民 (nong min—peasants, farmers), 解放军 (jie fang jun—revolutionary army), 地主 (di zhu—landlords), 台湾特务 (tai wan te wu—Secret Agents of Taiwan), or 坏蛋 (huai dan—bad guys). The above character-interaction dynamics generated the frequent use of verbs such as: 破坏 (po huai—sabotage), 剥削 (bo xue—exploit), 打到 (da dao—downfall); and adjectives such as: 勇敢 (yong gan—brave), 伟大 (wei da—grand, great), 鬼祟 (gui sui—sneaky), 狡诈 (jiao zha—shrewd), 恶毒 (e du—evil, poisonous, wicked). While attending college in Beijing, every week I would receive a letter from my mother. I would then open up a 3-page letter crowded with words in which I would skim through in about five seconds. Why? I could predict the lines already. There were always a few sentences about all was well with the family at home, proceeding to all was well with the entire nation. Then, there were the repeated advice about eating and sleeping well, and of course, studying hard. All these followed by her expectations that I, as a "flower" of the nation, should not do anything to let down my people and my nation, and to only contribute to their well-being. My mother was an avid and talented writer. The printing of her first novel, a college romance story, had to be paused on the printing machine because it did not fit into the larger atmosphere of the nation. I knew the language in her letters were not her real language, but together with the rest of the nation, she learned that the safest way to write was to write empty. Each word possesses a unique spirit of life. The words that are highly favored and frequently used in one historical period collectively make up the soul of the language for that specific period in time. Generations of children grow up unaware that their language are colored reflecting the period they are in. This is why, in the early 2000's, my generation of Chinese people were shocked and touched to discover that the children of China before our generation were once reading Chinese texts that were by far more elegant, more real, and more humane than what we had and now have. The main bulk of these historical materials in the form of elementary school textbooks published from around 1903 (the end of the Qing Dynasty) to late 1930's. We never knew they existed. We were under the impression that history is progressing and assumed that our textbooks should be better than those made during this distant and "uncharacteristic" time of Chinese history. Now we know that despite all the wars and chaos in the country, that was an unparalleled time Chinese history. Around 1903, the last dynasty of the Qing was scrambling for ways to save its falling fate. It had figured out that the only way to survive was to modernize the nation. After the dynasty's collapse in 1912, the newly established Republic of China kept the same goal. This goal inspired the brightest minds of the country to ponder over one question: What kind of people do we need to build a modern nation? That sense of freedom and social responsibility generated a campaign to build the new citizens of the future. The "new citizens" should be equipped with the best traditional values that are filtered through our modern scientific and democratic lenses, as well as additional universal values of humanity. This campaign began when the government started giving the right types of reading materials to children starting from when they first begin to learn to read and write. 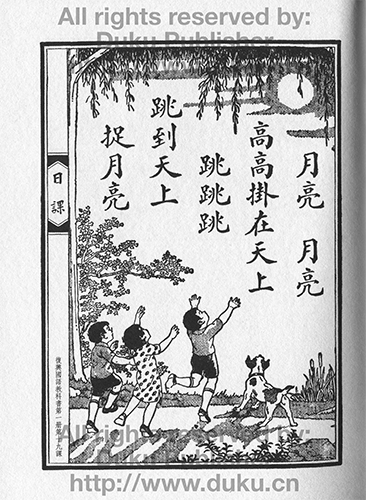 Against this backdrop, a host of elementary school textbooks, collectively called 民国教科书 (min guo jiao ke shu—The People's Textbooks), were published and went into the hands of children all over China. Each textbook features a collection of short poems, children's rhymes and stories. The top writers (such as 叶圣陶—Ye Shengtao) and artists (such as 丰子恺—Feng Zikai) were recruited to write and illustrate. The results were pieces of work that are friendly, earthy, elegant and distinctive in character. These pieces are so powerful that many in my generation were driven to tears because they bring us right to the heart of our language, culture and humanity. I have only read a small amount of these pieces and already feel there is an abundant to share with the children. Below are a couple of these pieces that students in Children's Chinese Book Garden (CCBG) will recite during our Poetry Event in April of 2015. The following poems, while they do not include human beings, other poems bring humans into the picture. However, instead of the humans being at the center of the plot, they are at the peripheral serving as sincere admirers of nature. "Ants on Floating Flower Petals"
Flowers fell on the water, going away with the flow; Little ants stand on the flower petals, like riding on a boat. In this poem illustrated with striking beauty, a few ants are standing on two flower petals, floating downstream. "Birds Returning to Their Nests"
It's late, there is only the birds' nest on the the tree and no birds there. Wait a minute, the first bird just came home; One bird is on the tree, flying, flying, flying, calling, calling, calling... Wait a minute, the second bird just came home; Two birds are on the tree, one flying, the other one calling. Wait a minute, the third bird just came home; Three birds are on the tree, not flying, not calling, but sleeping. In this poem, we first see an empty bird's nest, then we hear one bird flying back to its nest after another. They were busy for a while and then all went to sleep. 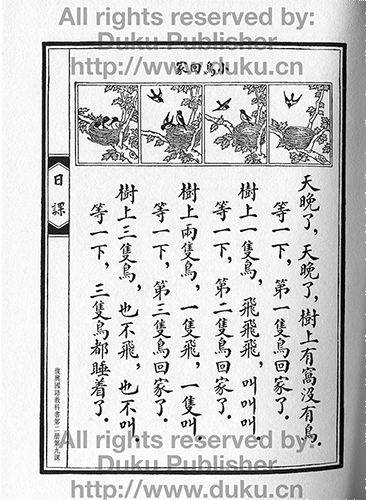 "Da Yan (Wild Goose) Flying South"
When the west winds rise, Da Yan fly to the South; In a while, they are lined up in the shape of the character 一 (yi); In a while, they are lined up in the shape of the character 人 (ren); The shapes are neat and tidy; At night they sleep together; During the day they fly together; They love each other and never want to separate. China is very big, in the Fall, many birds migrate north to south. The most commonly seen are a type of wild geese named 大雁 (da yan). The Chinese would look up to the sky and admire how neatly these geese line up while flying, and how cozy they huddle while they are sleeping. The Moon, the Moon, hanging high up in the sky; Jump, jump, jump, jump high to catch the Moon. How effusive are these children's feelings toward the moon! In the vast ocean, a boat is approaching; Its mast first appears, then its sails, and finally, its entire body. Two people are standing at the coast watching a boat's approach. The two must be so patient because the boat can only gradually reveals itself from the horizon. What else can explain such patience but their mesmerization of nature? Fireflies, fireflies; Flying west, flying east, and flying to the middle of our yard; Children say, "Fireflies, fireflies, fly here to shine on me while I'm reading"; Fireflies say, "Yes, yes, please make a crystal place for me." In this poem, children are watching fireflies. Beyond admiration, children are also catching some fireflies, putting them in a bottle, and making a lantern with them. There is nothing pretentious about bringing up the book reading theme because reading has been the most prized human activity throughout Chinese history. Of course, when we explain the poem to modern children, we always have to add in that the children in the past would always release the fireflies after reading was finished. In these ancient poems, in addition to nature, family life also appears at the center of the scene. The following poems are a couple of examples showing family members engaging in various activities and drawing a picturesque scene of lives that were lively, peaceful and dynamic. What a nice moon, shinning so bright; Mom is sitting on a chair, older brother is standing by; Younger sister and brother are playing hide-and-seek on the side. Under the moonlight in a pavilion, a mother is sitting on the chair, enjoying the scene of her children at play. The oldest son stands next to his mother and ready to serve as an intermediary between his mother and his younger siblings at any point—the exact role prescribed for the oldest son in a traditional Chinese family. My older sister cut white paper into a xique; She put it on the table; The wind blew and the xieque flew away. Xique (Magpie) is the favorite bird of many Chinese. The legend has it that if you hear a magpie's calls, something good is going to happen to you. The older sister just cut a xique using pieces of white paper and the wind carried it away—sending it off to give good fortunes to others. Older sister raises silkworms and silkworms have made cocoons around themselves; The yellow ones look like gold and the white ones look like silver. After the discovery of silk making using silkworms, many Chinese families' livelihood depended on raising silkworms as an income. In this poem, two sisters are looking seriously at the silkworm cocoons because they have to carefully monitor the health of each silkworm and cocoon. Not an extra word needs to be said about the girls' sense of responsibility towards the well-being of their family. Under the lamp light, older and younger sisters sit together making shadow puppets with their hands; The older sister as the chicken and the younger sister as the eagle; The eagle catches the chicken ad the younger sister laughs. Two sisters are playing hand shadow puppets—an eagle catching a chicken. The older sister is playing as the chicken and the younger sister is playing as the eagle. Why? Older children have the responsibility to entertain and yield to their younger siblings. In this case, the younger sister had the priority to experience the sense of power of the stronger character—the eagle. In the following poems, what the Chinese consider to be the most important family values are directly portrayed. Whatever the value is, these poems say it bluntly and right in your face. And because the presentation is so clear and honest, these poems instantly win our respect! When going out, the son should tell his parents; When returning home, the son should see his parents. This poem shows one common routine for children to show respect and responsibility toward their parents—before a child leaves home he goes to see his parents, letting them know that he's leaving; when he returns he goes to see his parents again to let them know that he is back. What is not written out in the poem is that this child must reassure his parents to not worry about his departure and to ask how his parents have been upon his return. It's late and my father is not home yet; I stand outside the door, yearning for his return. In this poem, the child stands outside his home waiting for his father to return home. Which child can't relate to this? Waiting outside the door is uniquely traditional Chinese and it captures the important Chinese rituals surrounding 迎 (ying—greet, welcome) and 送 (song—send off). The further you are away from your door to receive or to send off someone, the more respectful you are to that person. You do this to friends, guests and family members alike. Waving my hand, I say: Dad, take your seat; Mom, take your seat; Older brother, take your seat; Older sister, take your seat. In this poem, a boy is asking each of his family members to sit down to eat. As a ritual, he understands that it is not polite for him to sit down first. Beyond rituals, the boy cares about his family and looks forward to a cozy family time at the meal table. Note the word 坐 (zuo—to take a seat or to sit down) being repeated several times. It is a word that carries a lot of sentiment. When a Chinese person points to a chair and says "坐!" to another, he/she is not being rude or trying to be authoritative, but is instead showing care and respect. Mother cooked in the kitchen and the cake has been made; She let her son hold the cake and send it next door for neighbors to eat. In this poem, the mother has made some rice cakes and asked her child to send some to the neighbors. Sharing food with neighbors happens on a regular basis in traditional Chinese communities because food units a community. We have introduced all of the above poems (the language as well as the backgrounds) to children of our program ages 5 to 12. From the children's focus, silence, nodding and questions, we can see that they have found in the poems things they can relate to, things that are fresh, things they can enjoy and things to think about. And we hope you feel the same way!